Soul and comfort food queen Tanya Holland has perfected fried chicken and slow-cooked meats at her Oakland, California, restaurants B-Side BBQ and Brown Sugar Kitchen. The Rochester, New York, native took her first restaurant job waiting tables at a pub while studying Russian literature at the University of Virginia. After school, Holland made her way to Manhattan; in the late ’80s and early ’90s she worked as a hostess at the Cornelia Street Café, and later took shifts at Serge Raoul’s Cafe Rakel, and Bobby Flay’s fledgling Mesa Grill. Convinced that she wanted a career in the kitchen, Holland left for France where she pursued a grande diplôme at La Varenne Ecole de Cuisine in Burgundy. In the years following culinary school, Holland racked up experience at restaurants in Martha’s Vineyard, Boston and New York before making her way west. 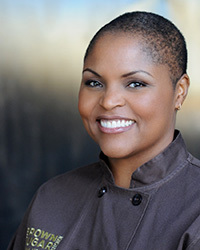 Her first book, New Soul Cooking, hit the shelves in 2003, paving the way for the opening of Brown Sugar Kitchen in 2008, and B-Side in 2011. The chef, who also served as a host of the Food Network’s Melting Pot series, chats with Food & Wine about chicken and waffles, and tamari. I’m definitely most well known for our chicken and waffles. We really take good care of it. We use a really good quality chicken, marinate it carefully, season it and hand-fry it on the stovetop with rice bran oil. We go through 15 cases of chicken a week! What dish really tells us your story as a chef? My shrimp and grits, not only because grits are part of my heritage, but also because the dish showcases a French technique—sauté—which speaks to my training a La Varenne. Of all our dishes, this one requires the most mise en place. We have all the vegetables cut up separately and we have a spice mixture for the shrimp. We mount the grits with butter and finish them with cream. It’s actually quite a complicated dish to prepare. How to make a vinaigrette. It’s as easy as buying a bottle of dressing that’s going to sit on the shelf for a while. Vinaigrettes are simple and are a good teaching tool for learning about emulsification, balance of flavor, salt and acid. You can use it as a marinade or as a sauce for seafood or meat. I wish I was a little better at butchering big cuts of meat. You can save a lot of money if you break down your own pieces of meat, and you get more control over the cut. Probably my Creole house spice blend with cayenne pepper, herbes de Provence and some cumin. It’s just really aromatic. I’ve used it with meats and with fish and even in a vegetarian dirty rice. It has some spice but also a really fragrant floral quality and that cumin flavor, which is very distinctive. I didn’t have a lot of money when I was in France, but I did get a cast-iron crêpe pan, which I still have. I just fell in love with crêpes when I was there. I loved cooking them, and buying them off the streets. Joe Beef in Montreal looks cool. I have their cookbook and they seem really passionate about what they’re doing. In New York, I’ve always wanted to eat at Per Se. I’ve eaten at the French Laundry, but not Thomas Keller’s Manhattan restaurant, so that’s on my list. And I’d love to go back to Herbsaint in New Orleans. I like Donald Link’s food. I would do a French brasserie, kind of like Balthazar in New York. That’s probably my favorite type of restaurant. It would have a little bit of southern French influence. I would make bouillabaisse for sure, and steak frites. I love marcona almonds, especially when they are roasted and salty. I’ll usually alternate that with dried fruit, like figs or something like that. My copy of La Varenne Pratique is all torn up at this point. It was so useful to me when I was first starting out. It skips from sauces to baking to chocolate making to butchery, and demonstrates these techniques with photos. It’s really encyclopedic.